Is this the right book for me? There are currently 35,000 franchisee businesses operating in the UK in a variety of different sectors, but choosing, evaluating and securing the right franchise is often the hardest part of the process. 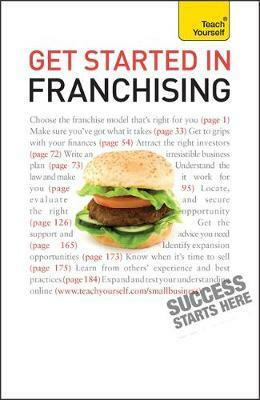 Get Started in Franchising is an indispensable guide that tells you how to achieve this - saving time and money in the process! As well as focusing on practical "how to" aspects of franchising, the book also provides help on UK financial and legal implications, priming you with the best advice possible before making your move. www.whichfranchise.com is delighted to have written a foreword for this book. Get Started in Franchising includes: Chapter 1: Introduction to franchising The development of franchising Filling a gap in the market How business format franchising works Advantages and disadvantages of franchising Seen from the franchisee's viewpoint Seen from the franchisor's viewpoint Franchising's growth continues What does the future hold? Chapter 2: The central characters in the franchising relationship What does it take to become a franchisee? What does it take to become a franchisor? Summary Other stakeholders Chapter 3: Financial aspects of franchising Typical financial obligations Franchise fees under the spotlight Case study 1 Case study 2 Securing finance for a franchise Questions a banker is likely to ask prospective franchisees Questions a banker may ask prospective franchisors A final word on financial aspects Chapter 4: The franchise agreement and related issues What does the law say? The franchise agreement The spirit of the franchise agreement The relationship between the franchise agreement and the operations manual Issues surrounding disclosure Requirements for the creation of a disclosure document Alternative methods of dispute resolution The ten most important things you need to remember Chapter 5: How to locate, evaluate and secure the right opportunity The best time to act is now! Lead generation The pre-selection process The evaluation process Additional considerations Wrapping it up Chapter 6: What should happen next? Initial support The smart franchisee's ten guiding principles for training Support continues indefinitely Expansion opportunities for franchisees How to get the best out of franchising Selling your franchise What if the unthinkable should happen? Formal franchisee representation The franchisee lifecycle concept Chapter 7: Where to turn for help Sources of information in the UK International sources of franchise information Conclusion ...Learn effortlessly with a new easy-to-read page design and interactive features: Not got much time? One, five and ten-minute introductions to key principles to get you started. Author insights Lots of instant help with common problems and quick tips for success, based on the author's many years of experience. Test yourself Tests in the book and online to keep track of your progress. Extend your knowledge Extra online articles to give you a richer understanding of the subject. Five things to remember Quick refreshers to help you remember the key facts. Try this Innovative exercises illustrate what you've learnt and how to use it. Kurt Illetschko is an internationally renowned authority on franchising, with experience of many successful franchise enterprises. He has written a number of books on the subject.